The UE65KS9500 produces hands down the most dramatic demonstration of what new HDR technology is capable of. Its brightness in particular is unprecedented, which helps it deliver a much fuller sense of HDR's expanded light range and colour capabilities than any other screen I've seen. The arrival of high dynamic range (HDR) picture technology has really shaken up the industry. While most would agree that HDR's expanded brightness range has a brilliant impact on picture quality, the technology is also proving tough for TVs to get right. Cue the Samsung UE65KS9500, which on paper at least looks better equipped than any TV before to unlock HDR's full potential. Particularly promising is a colossal maximum brightness of around 1400 nits that's more than twice bright as LG's latest OLED TVs. If winning in lighting isn't enough, Samsung's set also uses Quantum Dot technology to deliver comfortably more than 90% of the so-called DCI-P3 digital cinema colour range that's become the current target for today's high dynamic range displays. The UE65KS9500 does its best, too, to deliver more accurate backlighting than most LCD TVs by using an array of lights placed directly behind the screen and controlled by a local dimming system that can output independent levels of brightness from different light clusters. Samsung's flagship set is on a mission to dethrone LG's OLED G6 as this year's best TV. The KS9500 is a seriously attractive TV. Its silver frame is exceptionally slim and suitably shiny, and its dashing brushed aluminium 'boomerang' stand is a work of art. If there's one thing about the UE65KS9500's design that some people won't like, though, it will be its curved screen. 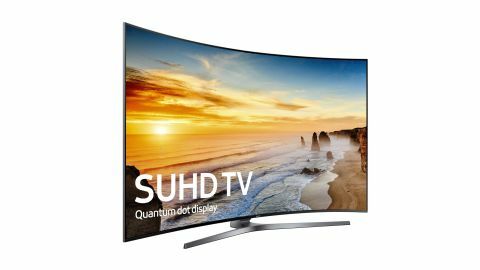 Curved screens have been dividing TV lovers since Samsung introduced them in 2014, and for all its stylish touches the UE65KS9500 is unlikely to sway the curved screen naysayers. Where the curved screen might be a problem is if you're thinking of hanging a KS9500 on your wall – the curve leads to a fairly hefty screen depth of 115.9mm (to go with an off-stand height of 833mm and width of 1441.6mm). At least you won't need to reach behind the set to plug in your cable box or various HDMI cables. The UE65KS9500's connections are all placed on an external connections box, meaning you only need a single cable running into your TV. The most important sockets on the connections box are four HDMIs – all capable of receiving Ultra HD HDR images at up to 60 frames a second – and a trio of USBs for multimedia playback. The TV also supports wired or Wi-Fi network connection to DLNA devices or Samsung's online services, as well as Bluetooth hook up to your mobile devices. Design TL;DR: It's sleek and futuristic but its curved screen won't be to everyone's tastes. While Samsung has always done well with the sheer amount of content available on its smart TV platform, its smart TV interface has not traditionally been the easiest to use. The second-generation Tizen platform used here, though, tries hard to put this right. One significant change is the addition of a second contextual row of icons that changes depending on the icon you've selected from the lower deck. This makes navigating through all the UE65KS9500's myriad content options much more intuitive and speedy. All your other downloaded apps or Samsung's app 'store' can be accessed via a simple selectable box on the left of the home screen, and as ever the sheer number of apps available for is extensive. The UE65KS9500's apps are headlined by 4K and HDR versions of Amazon and Netflix, and we're assured by Samsung that all of the 'big four' terrestrial broadcasters will have their catch up services available at some point, even though at the time of writing neither All4 or Demand 5 were available. It would be good, though, if Samsung followed Sony, Panasonic and LG in offering built-in Freetime, Freeview Play or YouView support. Smart TV TL;DR: Samsung's 2nd-gen Tizen interface makes the UE65KS9500's smart features much easier to use, and content options are expansive. As with many of the best high dynamic range-capable TVs this year, the UE65KS9500 is outstandingly good at showing us the standard dynamic range content most of us still watch the majority of the time. The backlight system Samsung's developed for handling the much more extreme demands of HDR copes effortlessly with SDR, combining gorgeously deep black colours with punchy whites within a single frame and producing an immaculately dynamic but also balanced and natural colour range. Best of all, considering we're talking about an LCD TV, dark standard dynamic range shots enjoy superbly uniform backlighting, with next to no clouding flaws even with the most contrast-rich sources, and no 'torchlight' effects in the picture's corners. The only time you might see some backlight 'halos' around very bright objects – a common phenomenon with direct LED TVs – is if you're watching from an angle of more than 30 degrees down the screen's sides. When it comes to upscaling the HD sources that still dominate our viewing time, the KS9500 is outstanding. Samsung's UHD upscaling engine has long been renowned for being peerless at making HD sources look sharper and more detailed, and if anything the KS9500 takes this prowess to a new level by adding more colour precision to the upscaling process, and removing more source noise. HD/SDR Performance TL;DR: It's hard to see how an LCD TV could make today's HD and SDR sources look any better. Being able to hit brightness peaks of 1400 lumens lets the UE65KS9500 deliver the bright end of HDR's expanded light range in spades – and it's truly a sight to behold. For instance, while watching Ultra HD Blu-ray images from the likes of The Revenant and Exodus: Gods & Kings, shots of skies, sunlight and reflections look unprecedentedly bright and dynamic, which makes the action feel much more intense, immersive and, in The Revenant's case, lifelike. It's not just with bright shots that the UE65KS9500 excels, though. It also combines its intense bright peaks in the same frame as startlingly deep black colours by LCD standards – yet both extremes always feel balanced and natural. The UE65KS9500 isn't just about HDR's extremes, though. It also does a better job than any rival TV of expressing all the little light and shade subtleties in both dark and bright areas that HDR introduces. This is especially true in the brightest areas, where even LG's mighty OLED TVs struggle. Put this groundbreaking dynamism with its exceptionally crisp UHD sharpness and stunningly rich, bold and expressive colours that do emphatic justice to the wide colour gamut technology sported by pretty much all HDR content we're seeing, and the UE65KS9500 really does deliver the all-round most next-generation picture I've seen to date. While the UE65KS9500 is at its tub-thumping best with native HDR content, it also carries a new HDR+ technology for converting standard dynamic range sources to HDR that's much more successful than similar systems from other brands – especially because it manages to genuinely expand the colour palette of SDR material rather than only injecting more brightness. Purists will still prefer to leave HDR+ turned off, but it will be a hit with people keen to make use of their TV's extreme capabilities as often as possible. Now for the bad news. Starting with the fact that getting as much brightness from LCD technology as the UE65KS9500 does inevitably leads to some unwanted light 'spillage' when watching HDR. In the UE65KS9500's case, these light flaws appear as halos or 'blooms' of light around very bright picture areas like torchlight or candles when they appear against a black backdrop. Another niggle is that the UE65KS9500 suffers with quite noticeable colour striping when dealing with HDR feeds from Ultra HD Blu-ray. Fortunately you can greatly reduce (but not remove) this issue by pushing the TV's dynamic contrast option higher than the default position adopted by the TV's most accurate Movie preset. But this isn't an ideal solution for image purists who want to see HDR exactly 'as the director intended'. Other rare issues are subtle light 'jets' coming in from the TV's corners during extremely high contrast content, occasional judder with camera pans, and a peculiar flickering effect when a picture contains large areas of unusually fine textural detail. 4K/HDR Performance TL;DR: Much of the time the UE65KS9500 delivers amazing UHD and HDR performance – though there's a trade-off in the form of occasional backlight issues. Despite its narrow frame and lack of any visible speakers, the UE65KS9500 sounds really good. The soundstage spreads far beyond the TV's physical borders in every direction without losing cohesion; there's enough bass on hand to deliver everything from deep male voices to explosions and the engines of vast alien space ships with surprising conviction; and the set can inject lots of treble detail without it sounding horribly harsh. The mid-range in which most soundtrack action takes place is open and wide enough to avoid that flat feeling with action scenes that defines so many of today's TVs, and the speakers are robust enough not to fall prey to crackling or 'popping' distortions. So impressive is the UE65KS9500's sound, in fact, that it gives the sound bars built into LG's G6 and E6 OLED TVs a run for their money. Sound quality TL;DR: The UE65KS9500 has the power and range to partner its huge, movie-friendly visuals with suitably cinematic sound. The main competitors for the UE65KS9500 are LG's 2016 E6 and G6 OLED TVs, plus the Panasonic TX-65DX902. Where the OLED models are concerned, the way each pixel in an OLED screen produces its own light gives them a key edge when it comes to showing bright HDR elements against dark backgrounds in that there's no unwanted light bleed. The latest OLED TVs also deliver the dark end of HDR's expanded brightness spectrum fantastically well, and are the best TVs in the world with standard dynamic range content. However, they're much less bright than the Samsung UE65KS9500, leaving them relatively lacking in impact and detail with bright HDR content. Looking at Samsung's own range, you can save some cash if you look down to Samsung's KS9000 series. These aren't quite as bright as the UE65KS9500 and as they use edge LED rather than direct LED lighting there can be larger backlight issues. But the KS9000 pictures are still likably aggressive in their delivery of HDR. Samsung's KS8000 series is also proving popular with consumers, combining as they do a much more affordable price with still-strong HDR picture performance and a flat rather than curved screen. The UE65KS9500 produces hands down the most dramatic demonstration of what new high dynamic range technology is capable of. Its brightness in particular is unprecedented, which helps it deliver a much fuller sense of HDR's expanded light range and colour capabilities than any other screen I've seen. The screen features that help it excel with HDR also make the UE65KS9500 gorgeous to behold with standard dynamic range sources, and it even sounds fantastic despite having no visible speakers. There is a price to pay for the UE65KS9500's groundbreaking brightness capabilities, though, in the shape of some occasionally distracting backlight 'blooming' issues with high dynamic range content. What this all adds up to is a straight choice between LG's E6 or G6 OLED TVs and the Samsung UE65KS9500. The OLED screens deliver superior black levels, avoid backlight bleed issues and excel with standard dynamic range content, but the UE65KS9500 delivers more punch, dynamism and detail with HDR. Try and get eyes on with both models if you can to see which suits your tastes more – though I would say that when it's firing on all cylinders with content that shows it off to its best advantage, the UE65KS9500 really does look like the future of television arrived early.